Whether you are a student on summer vacation, taking a gap year, or looking for a career break, if you want to get your hands dirty and see physical results volunteering overseas, our General Building Project in Tanzania may be ideal. 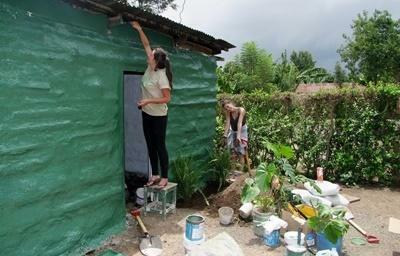 Building volunteers work in and around Arusha and are involved in helping to construct a variety of different buildings. This includes classrooms, libraries, and nursery schools in the communities in which we work. Volunteers work alongside a local builder, who will teach you all the necessary building and construction skills to enable you to take part fully in the construction process, and assist with all levels of building. The buildings are made using traditional methods and locally sourced materials. The construction techniques are simple to master and are ideal for sites with limited resources. No electricity is required at the site and everything is done by hand! Projects Abroad is currently working with local Maasai communities outside the town of Arusha. The primary focus is the Maasai village of Meserani, where Projects Abroad runs a nursery school. Our goal is to build a proper building for the nursery school. This will enable children from Mesarani and the surrounding communities to get pre-k education otherwise unavailable to them. The new building will provide volunteers with a space where they can work in a professional and well-structured environment. This is a long-term project that will last 6 months to a year. So far, we have built 3 classrooms where classes are already held. We aim to build 7 more classrooms and an office. In addition to our volunteers who teach at this school, we have also employed two local teachers who work on a permanent basis. We have already received a wonderful welcome from this community, who really see the value of having the volunteers here. We are excited for this opportunity to contribute to the community in such a lasting way and eager to have volunteers join the effort! The work of the volunteers is varied but may include digging foundations, mixing cement, building walls, constructing roofs, plastering, or putting the finishing coat of paint on a completed house. Building work usually takes place between 9am and 3pm. Work is dependent on weather conditions and the type of work being done on the day. For example, if it is too hot volunteers will stop working, or if you lay cement that needs to dry, you will only continue working on the following day. On some days, volunteers finish work at midday and have the afternoon free. During your stay, you'll have plenty of time to get involved in township life. Each site is overseen by a qualified builder from the community who will help volunteers with the construction process. You do not need previous building experience to take part in this project, although anyone who does have any relevant skills will be very welcome and able to take on a more specialized role. All volunteers should, however, be reasonably fit and prepared for working outdoors in a variety of weather conditions. Volunteers live with local families in the area.